Radio: COMAND Navigation -inc: high resolution 12.3" display fast HDD navigation w/3D maps map updates & live traffic included for 3 years WiFi hotspot w/4G-LTE internet connection smartphone integration w/Apple CarPlay and Android Auto Bluetooth hands-free and audio streaming voice-operated control system and car-to-x communication NFC wireless charging is part of Premium P01 package. 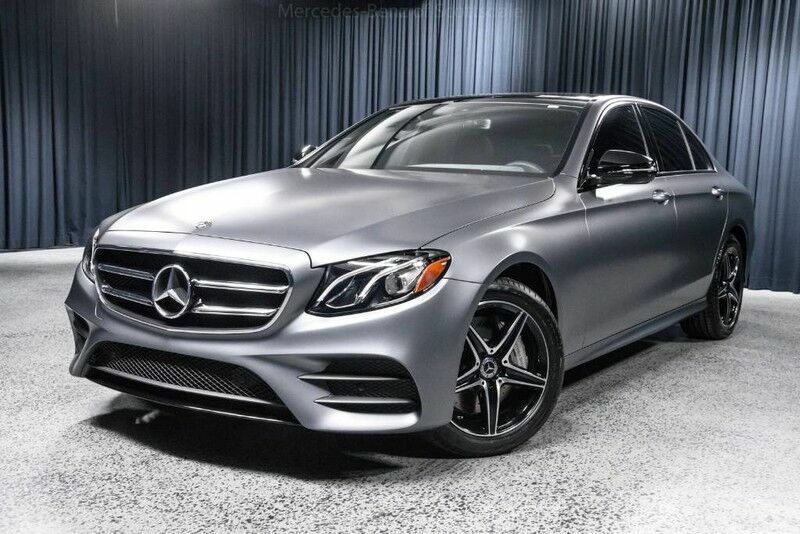 This 2019 Mercedes-Benz E-Class E 300 4MATIC is proudly offered by Mercedes-Benz of Scottsdale This Mercedes-Benz includes: BLIND SPOT ASSIST Blind Spot Monitor DESIGNO SELENITE GREY MAGNO PANORAMA ROOF Generic Sun/Moonroof Sun/Moonroof Dual Moonroof AMG LINE EXTERIOR 4-Wheel Disc Brakes Front Disc/Rear Drum Brakes PREMIUM 1 PACKAGE Keyless Start HD Radio Hands-Free Liftgate Satellite Radio Power Door Locks Keyless Entry Remote Trunk Release NIGHT PACKAGE BLACK, LEATHER UPHOLSTERY Vinyl Seats Cloth Seats Leather Seats Premium Synthetic Seats *Note - For third party subscriptions or services, please contact the dealer for more information. * There's a level of quality and refinement in this Mercedes-Benz E-Class that you won't find in your average vehicle. This Mercedes-Benz E-Class E 300 4MATIC comes equipped with all wheel drive, which means no limitations as to how or where you can drive. Different terrains and varying weather conditions will have little effect as to how this vehicle performs. Marked by excellent quality and features with unmistakable refined leather interior that added value and class to the Mercedes-Benz E-Class Enjoy the drive without worrying about directions thanks to the built-in navigation system. This outstanding example of a 2019 Mercedes-Benz E-Class E 300 is offered by Mercedes-Benz of Scottsdale. Pull up in the vehicle and the valet will want to parked on the front row. This Mercedes-Benz E-Class is the vehicle others dream to own. Don't miss your chance to make it your new ride. Few vehicles can match the safety and comfort of this AWD Mercedes-Benz E-Class E 300. With enhanced performance, refined interior and exceptional fuel efficiency, this AWD Mercedes-Benz is in a class of its own. You've found the one you've been looking for. Your dream car. Just what you've been looking for. With quality in mind, this vehicle is the perfect addition to take home.